Prison Chaplains offer a listening ear to all, whether of any faith or none. There are many aspects of life that become especially difficult in the midst of imprisonment: maintaining relationships; anxieties about accommodation, employment or money; being apart from loved ones at significant moments such as birthdays, anniversaries and festivals; handling bereavement and loss. 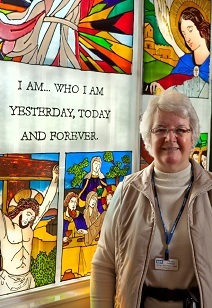 Our chaplains offer a person-centred approach, emotional support, spiritual and religious care. Together with others, Chaplains work towards enabling people find strategies not only to cope with prison but to look forward with hope to the future, to see possibilities and grasp opportunities, developing gifts and assets and raising self-esteem. Chaplains are accredited and recognised representatives of their Church or Faith Community and can link into the resources of their Faith group to support prisoners and their families and to facilitate a return to the community. As well as providing care for all, Chaplains also provide the means by which a person in prison can explore or practice their Faith, delivering religious care according to a Framework for Spiritual Care, Religion and Belief which ensures, amongst other things, that all people’s beliefs are respected. Nearly 60% of offenders in custody, when asked, say they have a religion and Chaplains seek to ensure that appropriate practice is provided for those who wish to observe their religion whilst in prison. There are regular services of worship or prayers in prison and Chaplains facilitate visits from recognised religious leaders of the World Faiths following a prisoner’s request for a visit. Though focused on the support of those in custody, Chaplains also have a caring role in relation to the whole prison community and often give up their time to staff and those working with agencies in prison. They may also represent the prison to the Churches and the Faith Communities, offering a vision of working together to build a safer society. Chaplaincy brings the great satisfaction that comes from accompanying people through challenging times.